Some of the author's friends in El Salvador. In Valentines month it is time to remember our friends. 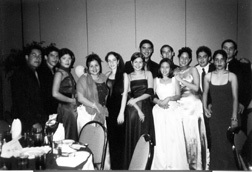 For me, it’s the time I think about my friends that I left in El Salvador. I remember all the good and fun moments that we had during my time with them. I have many friends from different ages. Some of them I’m have known since I was small. The other ones are from the schools I went to during my elementary and high school days. I still talk to my friends by e-mail, chatting by MSN messenger or by talking on the phone. We send pictures to each other too, and we still share a lot of things. I really miss them and I know they miss me, too. I can’t compare our friendship with anything in the world. I remember that at school we used to have lunch together and go to the gym and give them encouragement to win!! They still do that because it doesn’t matter if they graduated from high school already, they keep having their school spirit inside. I miss all thethings that I can’t do anymore here. Here my friends don’t have time to have a little fun because they have to work. On spring break my friends, my family’s friends, and I used to go to the beach and sleep over for a few days. They were the best moments in my life because there we used to forget about schoolwork and many other things also. There we used to have a lot of fun, swimming, running, eating. Between my friends and me there was no selfishness. We never argued about who was better, who had more money, who was more popular. We were all the same and we didn’t have any secrets between us. We helped each other and even when we were on vacation, we still met each other to have fun or to hang out a little bit. As I was thinking and writing about friendship, on December, 17, 2003 I lost one of my friends. His name was Joel. Hearing about his death was the most awful news that I have had since I came here. I will always remember him forever because he was so nice, respectful and loving to everybody. In situations like this we are still together and I’m very thankful to God because he has given me so many good friends that I would like to keep having forever.